"It's alive! IT'S ALIVEEEEE"Deep in the darkest forest there is a castle owned by the Frankenstein family. On a dark and stormy night lightening hit a giant metal pole that was sticking out of the castle's roof. From that spark of nature it brought to life a monster that began to terrorize the local villagers. Now you can become the creature made of dead body parts with this Frankenstein costume. So you tried to make your own monster in time for Halloween, but it didn't work? That's okay. Even the Mad Scientist had to have a few tries before it worked. 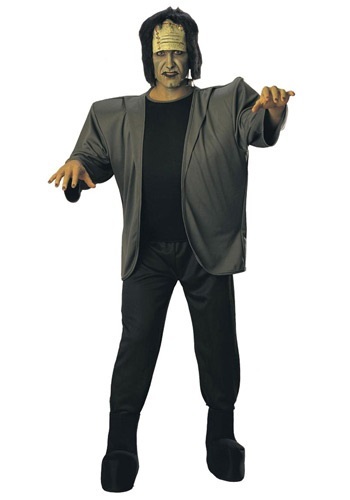 Instead, go as your favorite man-made monster in this Big Frank Costume. The ladies are sure to swoon. 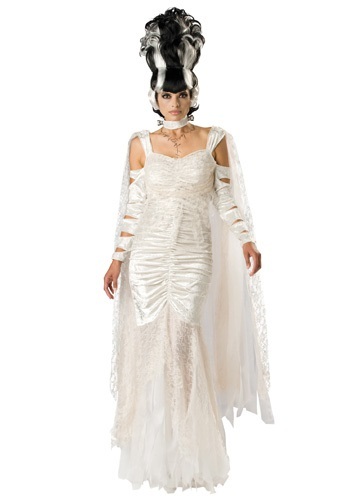 You'll look scarily stunning in this Bride of Frankenstein Costume. Just add creepy makeup and a beehive wig for the ultimate horrific look. It's time to roam distant villages and plunger through windmills without your owner. No? You still want your master around? Well fine. But I was only trying to help you out. Cause a little mayhem in town in this Deluxe Frankenstein Costume. Deep in the darkest forest there is a large castle own by the Frankenstein family. Inside that castle Doctor Victor Frankenstein is hard at work creating a creature out of the parts of dead body parts. Once he had finish he shocked it with the power of electricity to bring his monster to life. 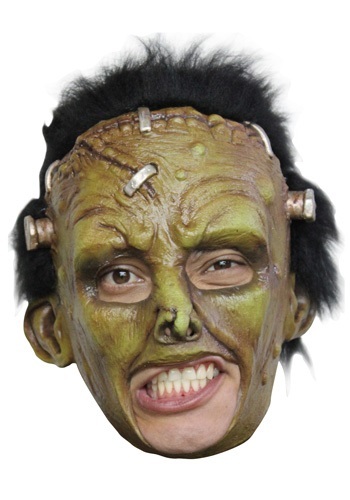 Now you can look just like Doctor Frankenstein's creation when you slip this mask on. Pair this with one of our great monster costumes for a ghoulish good time! There's a big day waiting ahead for you. Just don't get too freaked out when you see your husband to be. He's a big, green-ish, tall man and a little different. He doesn't like to be pointed at or poked fun of so make sure your facial expressions don't change. But, then again, since you're a little different yourself, I think it will go swimmingly. It's alive! Your puppy...is ALIVE! Oh, you already knew that? Well, with this Frankenpup Dog Costume you may have a hard time not saying phrases like that. Despite being based on the classic Frankenstein horror monster, we have the feeling that your puppy will still be irresistibly cute while wearing it. When Doctor Frankenstein went to go create his creature he needed to stitch together various body parts. After he found all the pieces and put it together he gave that monster life. 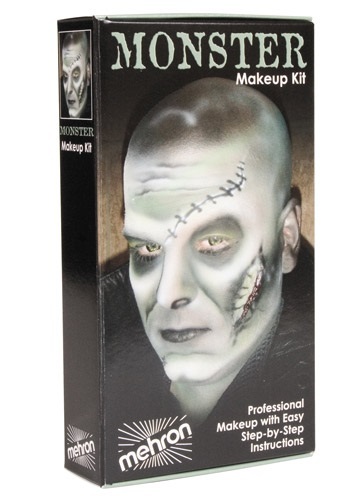 This Halloween you'll have to go through way less trouble becoming that monster with this great makeup kit. Did you know that Dr. Frankenstein experimented on dogs before he created his first human monster? I didn't, either. 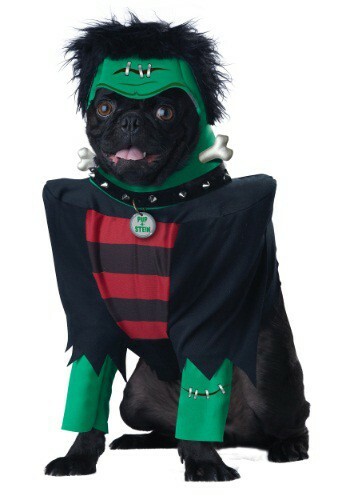 But if he had, the result might have looked like your dog wearing this Frankenstein Pet Costume! Frankenstein is actually a pretty decent boyfriend! He's tall, dark and well, maybe handsome isn't the right word for it, but 2 out of 3 isn't too bad. He also likes a girl who knows how to dress in Goth and he's a little bit of a bad boy. On top of all that, he's totally not afraid of commitment. Of course, if your little girl is looking to be his new lady, she should probably be wearing this Frankie's Bride costume, which is full of the Goth look he likes. We're not exactly what creature Creepy Carol is supposed to be. Sure, we know that Garbage Pail Kids are based on those cute Cabbage Patch dolls but this mutant version gave us a challenge in trying to determine, what it really is. A Frankenstein- swamp monster perhaps? It has stitches, boils and purple skin! What sound does such a creature make? Only you can answer that! Be a cool & funky monster for Halloween in this Girls Funky Frankie Costume! 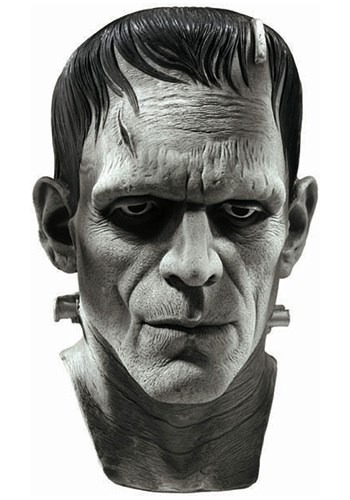 Just add creepy makeup and a monster wig, and you can be Frankenstein's creation. If you were to travel to 1313 Mockingbird Lane you'll see a house that might look a little spooky, but don't be afraid. Because as you learned in school, don't judge a book by its cover. Inside this house lives the loving family known as the Munsters, and the head of the house is named Herman. Now the thing about Herman is that if you make him laugh he may lose an arm or a leg due to the fact that he is literally in stitches. Now you can become the classic television character in this fun costume. Warning: Mad scientist experiment gone cute! This is an adorable and classic Infant Monster Boo Costume makes a great first Halloween costume idea! Pair it with our other monster costumes and maybe make your own creature feature! IT'S ALIVE! The scientist created a creepy monster that can walk and talk! 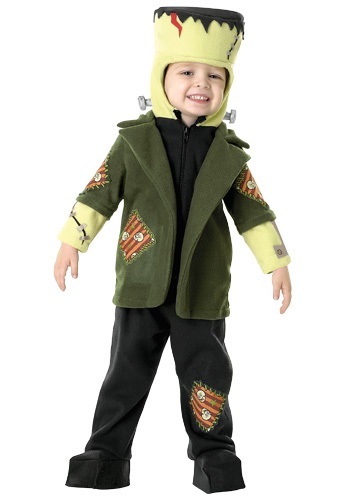 This Kids Reanimated Monster Costume is a great Frankenstein themed costume for kids. When you are on Mockingbird Lane you'll no doubt notice the house numbered 1313. This gothic wonder to that sticks out in the neighborhood gets its look due to all the hard work that Lily Munster has put into it. She has spend hours making sure the cobwebs are just right and that there is just the right about of grimmness to it. And after a hard day's work of making the Munster home look just right she relaxes with her wonderful husband Herman. Now you can look just the classic television vampire mom in this ghoulish costume. Thinking of collecting body parts and making your own living breathing monster? You're going to need a lot! But first things first, you're going to need to look the part. Don't start mutilating your own face to look more like the doctor, just wear this Mad Monster Party Adult Baron Von Frankenstein Mask. Now, let the experimenting begin! If you've been thinking about joining the Worldwide Organization of Monsters, Fang would be a good choice. Since he's Frankenstein's Monster, he has all of abilites of Frankenstein's fame, but as usual can be a little bit dimwitted. Channel the cult classic Mad Monster Party with this authentic mask. You can be a little bit retro and still be cool when you go as a cult classic! Interested in a career in science? 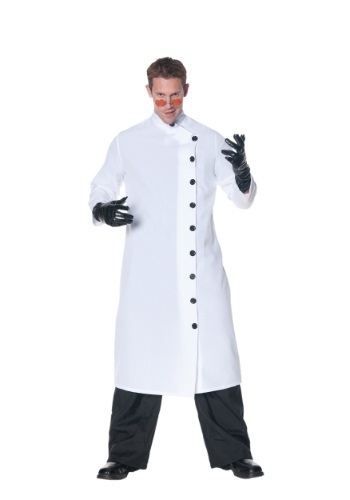 Why not give mad scientist a try! You get to be your own boss, work your own hours and select only the projects that YOU want to work on. From human-like abominations, to evil doomsday devices, the sky is the limit on what kind of projects you can complete! The only real requirement for becoming one is a white lab coat, reckless abandon and perhaps the laugh that bespeaks your insanity. This costume should get you started down that road, no problem. Take your monster costume to new heights this Halloween with a pair of mens monster shoes. 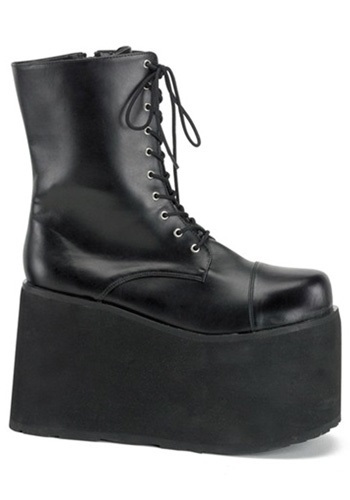 These black boots will keep you above the crowd and help you scare up a good time. Metal 'Stein was one of the later creations of the famous monster maker. Like his "brothers" he was assembled from various cadaver parts but was upgraded with metal pieces to be the most ferocious monster of them all. The poor villagers will be in for a terror of rage and metal fury when you wear this realistic costume mask! All of Frankie's dreams really will come true when he sees you! Give him something to drool about (or whatever assembled men do) with this Pin Up Frankie Costume. Now, he'll be the one getting angry at the townspeople for staring at you. SHE'S ALIVE! After Doctor Frankenstein made his green-faced creature, he thought that he'd get lonely being the only reanimated person on the planet. So he got to work. He spent day and night trying to find just the right pieces so that his lady monster would be just perfect. Which is what he did. He made the perfect woman for his creature to hang out with. "It's alive!!! "The Frankenstein Monster is a beast that was created from the dug up body parts from a graveyard along with the brain of a madman. When Doctor Frankenstein put these together and fueled it with electricity what he got was a reanimated horror. Since his first steps he has been roaming the country side in mindless anger. 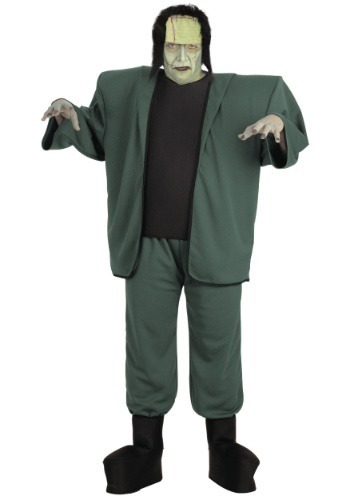 Now you can become the monster from the classic story and movies in this spooky Frankenstein creature costume. What to know Frankenstien's secret? Okay. Well, maybe not his actually one (he was a little resistant to give that away). 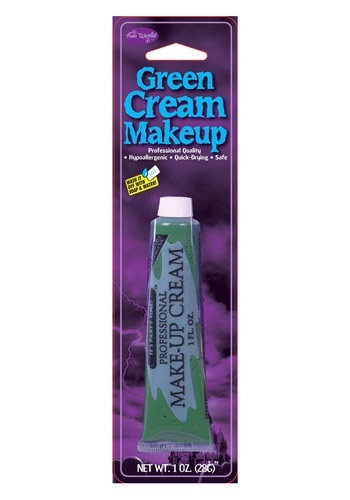 But, you'll look as close as you possibly can with this Professional Cream Makeup-Green. Now your child can become an adorable monster this Halloween without having to get struck by lightning. That's right, this Funkie Frankie costume is just the thing to let your little girl become a fun creature this holiday. "It's ALIVE! 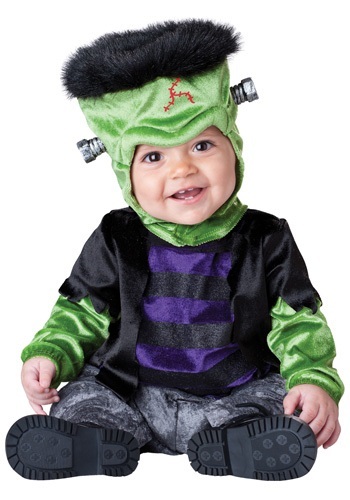 "Turn your little one into a monster this Halloween with this Frankenstein costume. There will be no need to use electricity or lightening to make your child come to life, just show him some candy. 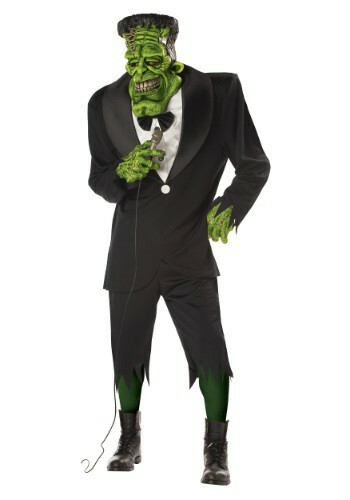 This is a classic costume to make sure your child's holiday will be a monster mash bash! Poor Frankie. Always so down in the dumps because he's back from the dead... But what about cute clothes, candy, and friends? Prove that there are a few things about living to be happy for with this Tween Creature Costume Set.